"Innovation comes from ideas. Ideas come from act of being creative. Creativity arises from emotions of love or fear. Love is more lasting." Organizations faced with business challenges often choose between taking on the problem themselves and outsourcing for a solution. Our research and experience clearly indicates that organizations that do-it- themselves through engaging their employees and by using purposeful and deliberate innovation practices have a higher likelihood of generating viable solutions that create competitive advantage. Further, these organizations are more likely to be able to repeat their innovation success and enhance speed to market and operational efficiencies. 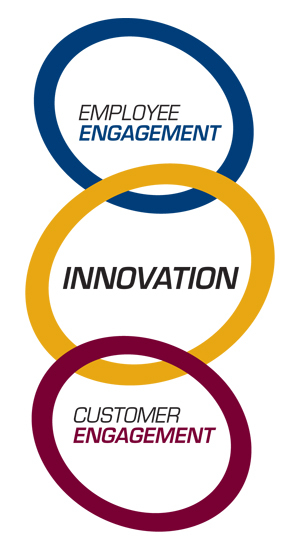 At the DeSai Group our objective is to make you and your employees the experts on Innovation. That is what Strategy Driven Innovationsm is all about. We teach you how to create an innovation driven organization. You retain the learning's and develop the distinctive know-how to make your organization the formidable competitor in your space. Employees who are engaged will actively listen to customers and in doing so identify opportunities to better serve them. When customers sense commitment from their product and service providers they willingly and actively provide valuable ideas and volunteer their time to relate their experiences thus providing useful insights for fueling additional innovation. By leveraging the total capabilities of your workforce and engaging your employees' maximum potential, your business can begin the strategic process of developing customer engagement and, in turn, facilitate employee engagement through innovation. help your organization create an "innovation funnel" where ideas for new services, products, and business models will be captured, critically evaluated, and ultimately utilized for real value creation and competitive superiority. Leverage our expertise to help enable your organization to develop a strategic framework that will allow you to engage customers more effectively. We have diagnostic tools at our disposal including our Innovation Readiness Assessment (IRA)SM and the Innovation StylesTM inventory which will assist in assessing your propensity to innovate and help you restructure your organization to maximize strategic idea development tied directly to your business strategy.